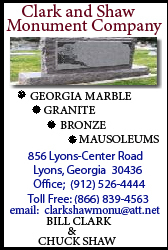 March 7--Funeral services for Ms. Betty Mae Jordan, age 62 of Mount Vernon, Georgia will be held Saturday, March 9, 2019 at 3:00P.M. in the Historical First African Baptist Church with Rev. James E. Love officiating. The burial will follow in the Live Oak Cemetery in Ailey, Georgia. Betty attended Montgomery County Schools and the Georgia School for the Deaf in Cave Spring, Georgia. She was employed as a homemaker/cook for the Braddy’s Farm House, and was a member of Historical First African Baptist Church in Mount Vernon, Georgia. Survivors include one daughter, Martha Brown; three granddaughters: Taliajah M. Brown, Kimbreyetta Carswell, and Kalise S. Carswell; five siblings: Carrie B. Jordan, Lula A. Jordan, Mary A. Jordan, Larry C. Brownlee, and Charles (Shadice) Brownlee aka Baldhead. The viewing will be Friday, March 8, 2019 at 1:00P.M. – 6:00P.M. in the Baker Funeral Home of Soperton, Georgia. Baker Funeral Home of Soperton, has charge of the arrangements.